Do you want to relax, rejuvenate, and go unnoticed in the midst of the Mexican Caribbean playground of Cancun? 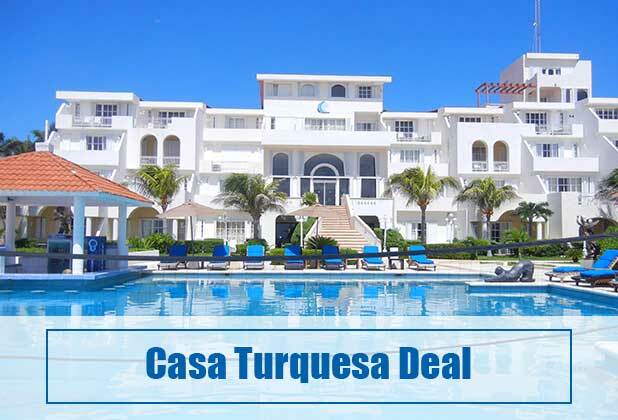 Hotel Casa Turquesa is the perfect haven for your needs. We provide a more sublime experience compared to the larger resorts in the area. Our luxurious, all-suite boutique hotel offers seclusion and sophistication. Our accommodations befit the demands of the most discriminating guests. 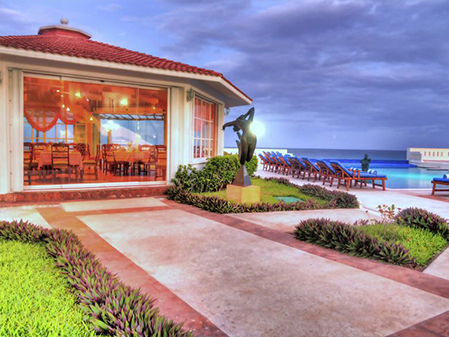 Our intimate oceanfront property provides an upscale and artful environment. Hotel Casa Turquesa is perfect for a decadent getaway. Reminiscent of a Mediterranean mansion, Casa Turquesa rests at one of the area’s most pristine beaches. It features only 30 suites, providing an atmosphere of privacy and tranquility. By limiting our accommodations, we make sure that we can provide highly personalized service to all our guests. We maintain the environment of exclusivity that our clientele seeks. The hotel is also home to an exquisite collection of artwork, which is part of the hotel’s distinct character. Rina Lazo’s Mural Los Frutos de la Tierra, Rafael Aguirre’s Mural Xtabay, and Bravo’s Sculpture Lovers at the Reefare are some of the treasures you can find within the property. With such gorgeous interiors, well-kept grounds, and glorious views of the sea, it’s no surprise that Casa Turquesa has become a favorite venue for private hideaway weddings in Cancun. 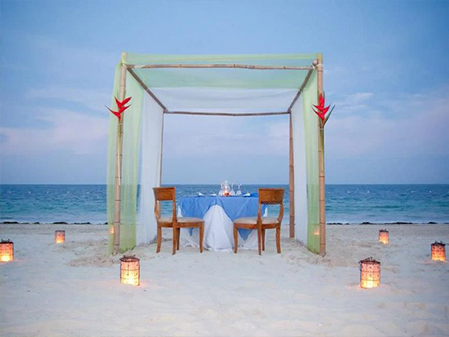 We can accommodate a full-scale symbolic or Mayan wedding for up to 70 guests. We can also arrange a simple ceremony for those want an intimate setting with just a few friends to bear witness. We can help take care of the details, from flowers to the limousine service. We make sure that our facilities and services are up to the standards of even the most demanding of guests. Casa Turquesa provides first class bar and dining experience, plus a 24-hour room service. Service is nothing but exemplary courtesy of our multilingual staff. For those who want to venture outside, there are lots of options for dining and entertainment near the property. 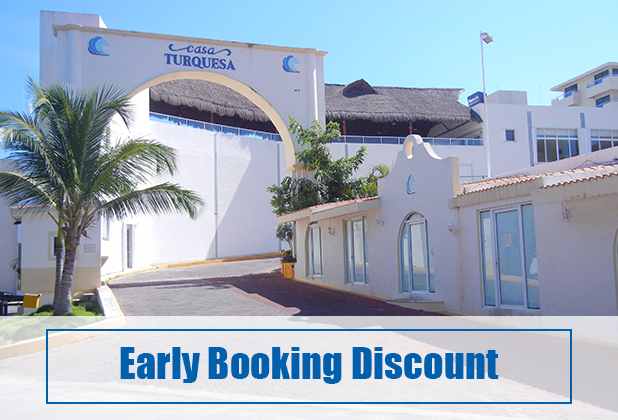 Hotel Casa Turquesa is near upscale shopping malls, bars and restaurants, as well the El Rey Ruins. We offer 30 beautifully decorated suites that provide gorgeous views of the ocean or the immaculate grounds. 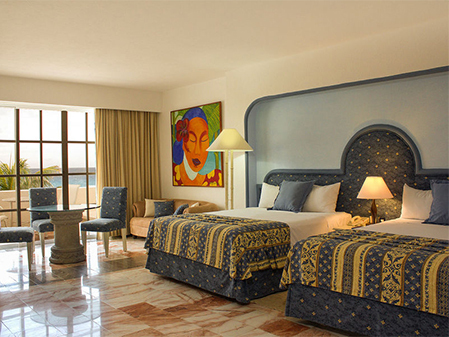 Each suite has generous square footage, big beds, and decors that can rouse your artistic instincts. Aside from the standards such as large flatscreen TVs and high-speed internet access, our suites also have a walk-in dressing room with closet. Some of the suites have direct access to the swimming pool and beach. Let our multilingual staff guide help you with what you need courtesy of our excellent facilities and services. Whether you’re a jetsetter looking for some privacy or a businessman in between high-powered travels, we can help give you the kind of rest and relaxation you deserve. Reward your palates with our fine restaurants. Feel the stress melt away at the hands of our expert masseuse. Get to and from the hotel with ease through our shuttle service. We are far enough for an intimate and secluded away but still near enough to places of interest in this part of Cancun. Retail therapy is within easy reach courtesy of nearby upscale malls. Craving for some sightseeing? The El Rey Ruins is near the hotel, as well as the Interactive Aquarium and Museo Sensorial del Tequila.